Signs by Crannie is a full-service, electrical sign design, construction and installation business. We are specialists in national sub-contracted installations. Our services include fast, professional sign repair including commercial neon, pylon, lighted cabinets, digital signs and electronic message centers. Call us for a free quotation on your next sign project. Financing available. We serve Lee County, Collier County and Charlotte County, Fort Myers, Cape Coral, Naples, Bonita Springs, Lehigh Acres, Estero and the surrounding areas. 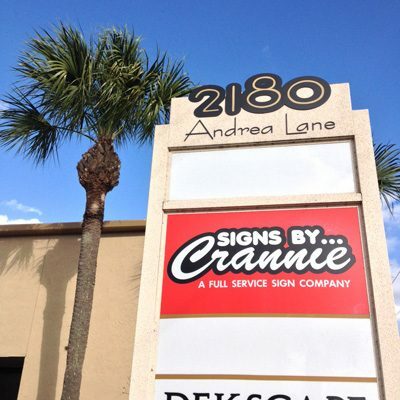 Signs by Crannie in Fort Myers was started by Dan Crannie, owner of Signs by Crannie in Flushing, Michigan. During a vacation in Florida over a decade ago Dan overheard several business owners who were frustrated with the speed and quality of local signs companies. Knowing that he had built a successful Michigan business on a combination of fast service and a quality product at a fair price, Dan decided to open a new location in Fort Myers. He purchased a second home, and over the next year he poured over the books to learn all the skills required to pass the Florida Sign (Electrical) Contractor License exams. Since then Dan has split his time between his Michigan and Florida factories, continuously focused on how he can create the best signs. When Dan is not in Florida, the Ft. Myers office is lead by Rene Kilbourne. Rene brings many years experience to the company and oversees both production and sales.